The early diagnosis on Fred Jackson, according to Jason La Canfora’s Sunday afternoon tweet, is a sprained LCL. An isolated LCL tear, depending on the grade, is often allowed to heal without surgery and could keep Jackson out anywhere from 2-6 weeks. Posterolateral corner of knee. Note: FCL = LCL. Photo from kneeguru.co.uk. But there may be more to Jackson’s injury. Injuries to the outer ligament of the knee are uncommon in football players as they are more often hit on the outside of the knee (which can stretch/tear the ligaments to the inside) than the inside of the knee (which can stretch/tear the outside ligament). Jackson’s mechanism was a hit to the front of his knee while it was hyperextended. 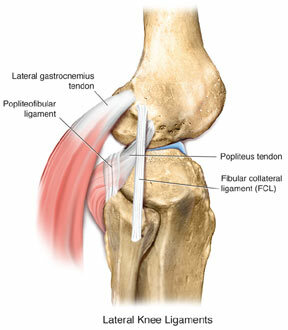 That mechanism makes an injury to the posterolateral corner (PLC) of the knee possible. The PLC includes the LCL but a number of other ligament, tendon and cartilage structures. Injuries to the region may also associated with ACL or PCL tears. If Jackson’s injury does include damage to other PLC structures (or the ACL or PCL), it’s a much more severe injury than a simple LCL strain. Partial PLC injuries often require 6-10 weeks of rehabilitation or more and may still require surgery if the knee remains unstable after rehab. More severe injuries or injuries to more than one structure usually require surgery and at least 4-6 months of rehab. The last NFL player I recall having a PLC injury was Shawne Merriman. After briefly trying to play through the injury, Merriman decided to have surgery and had yet to recover his former explosiveness before tearing his Achilles. Chan Gailey didn’t seem to concerned during his post-game press conference, saying that Jackson’s injury didn’t appear to be as severe as the knee injury suffered by Donald Jones David Nelson, which is believed to be an ACL tear. That’s reassuring, but Jackson’s MRI tomorrow will determine the severity of the LCL injury and whether he has any PLC damage. Hopefully, the news will be good. David Nelson, not Donald Jones, right? Nelson with ACL not Jones, right? Correct. That’s the third time I’ve typed that incorrectly tonight. Caught the first two, missed this one. Thanks very much.